The Canada Goose. Bird Watching Canada Geese. Description - The Canada Goose is the most familiar and common of geese in Canada. The size decreases northward with the smallest living in the high Arctic coastal tundra. A brownish body with a black head, long black neck and white chin strap characterize the colouring of this goose. A rich, musical honking is the call of the larger species and a high pitched cackling is that of the smaller. 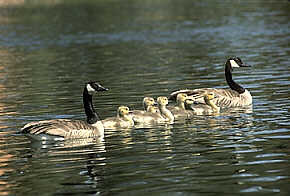 Distribution - This goose lives throughout the majority of North America in lakes, bays, rivers and marshes. They are often seen feeding in open grasslands and stubble fields. They have become a semi-domesticated bird in city parks and on reservoirs. Biology - The Canada goose is well known for it's V-shaped migrating flocks and characteristic honk. They are chiefly grazers, feeding on stubble fields and marsh vegetation. There are 11 geographical races; some with populations well over a million, some barely over one thousand.